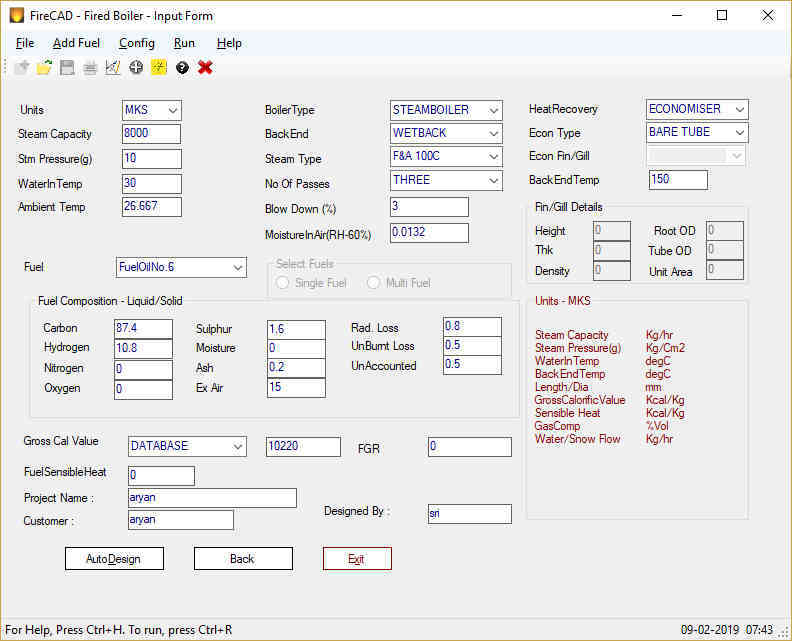 Fire tube Boiler design software is useful for designing Fire Tube Package Boilers and Waste heat boilers. Different types of fire tube boilers like oil fired boilers,gas fired boilers and coal boiler and other solid fuel fired boilers can be designed using this software. 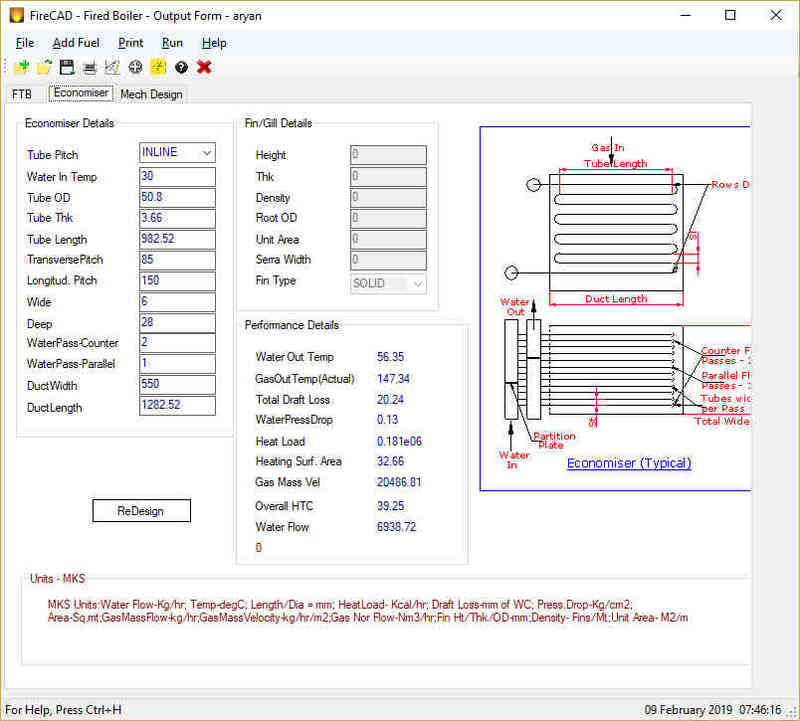 Useful for novice as well as expert design engineers for quick and accurate designs. FireCAD comes with Fuel and Waste gases database. Smoke Tube (Fire Tube) Package Boilers of any range and pressure, Solid,Oil,Gas fired, Wet back or Dry back and 2,3,4 pass Boilers can be designed. Similarly Waste heat boilers(Fire Tube) for Chemical/DG set/Process/Metallurgical/Power plants can be designed. Fired/Unfired Hot Water Generators can be designed. Option to include Economiser with Bare/Fin/Gill tubes. 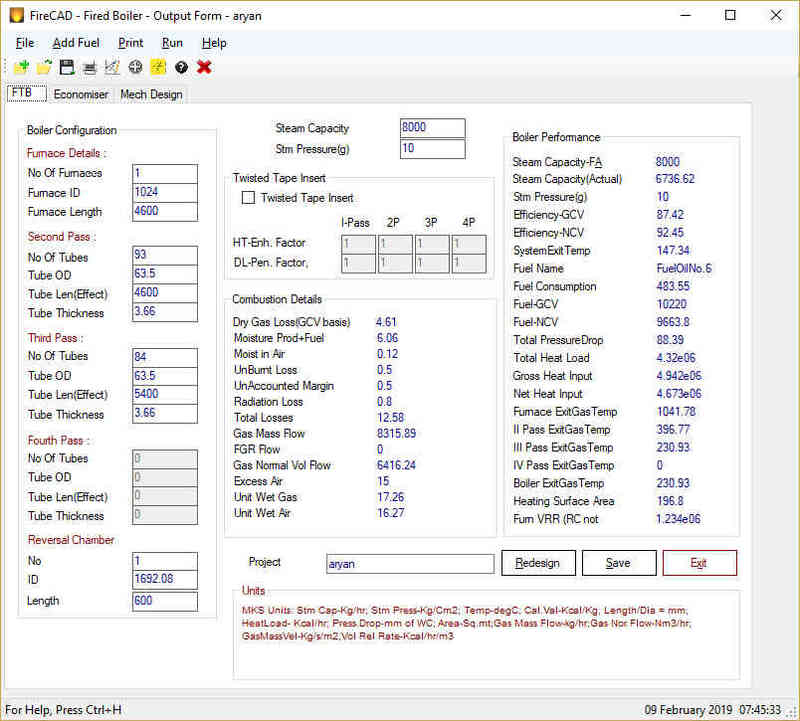 Shell diameter calculations for Integral Steam space as well as Elevated Drum Type Boilers added for Waste Heat Boilers. In Fire tube boilers, water is contained in a shell and hot gases pass through the tubes. Burners are provided to fire the fuel inside the furnace. In case of solid fuels, stationery or movable chain grates are provided inside the furnace. Fire tube boilers can be either wet back or dry back. In wet back boilers, turnaround channel or reversible chamber is present at the rear end of furnace. Fire tube boilers can be two pass, three pass or four pass type. in regular scotch marine boilers, fuel is fired in furnace and the hot gases pass thorough second and third pass before leaving the boiler to chimney. In revotherm or reversible flame boilers, fuel is fired and hot gases are reversed in the same furnace and enter the second pass at the front side. Most of these boilers are integral steam space type and a few elevated drum type. In case of elevated drum type, bottom evaporator is connected to top steam/water drum with riders and downcomers. Boiler repairs and maintenance are minimum in fire tube boilers. Many of these boilers are also available on rent (boiler rental) and used as mobile boilers. Fired fire tube boilers consists of a furnace and 2 to 4 gas passes. 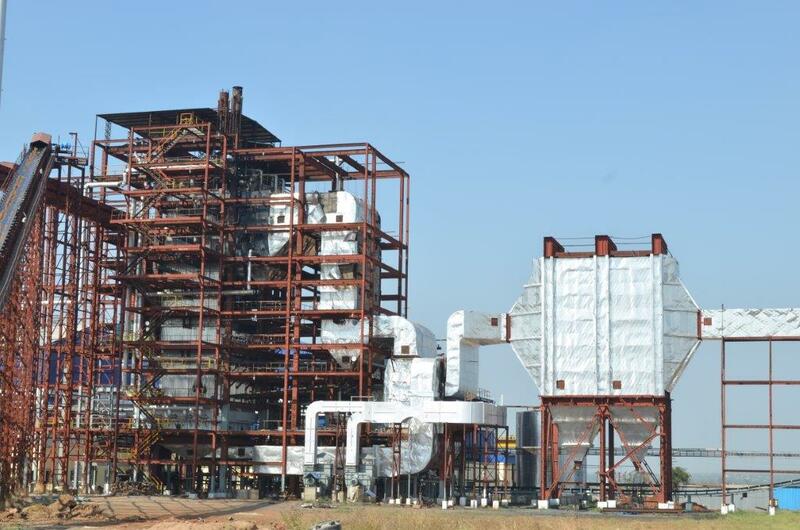 Fire tube boiler is fitted with either fuel burner in case of oil/gas firing and a grate in case of solid fuels. Then there are front and rear gas boxes to turn the gases from one pass to the other. In heat recovery fire tube boiler, there will not be any furnace and only gas passes are present. In case of Elevated drum type, there is one additional steam drum and a set of downcomers and risers. Twin furnace boilers are also common for higher capacity boilers above 15,000 Kg/hr (33,000 lb/hr). Furnace in Fire tube boilers is cylindrical in shape surrounded by water on outer side and with burner and flame inside. Plain furnaces are provided with bowling hoops to take care of expansion and also to act as stiffener supports. Corrugated furnaces are also common wherein 30 – 100% of the total furnace is corrugated to take care of the expansion due to flame. Rear end of the furnace is connected to reversible chamber or turnaround channel in wet back boilers. Boiler codes prescribe minimum furnace diameter for a given heat input. Furnace diameter provided shall be bigger than this minimum requirement. There are restrictions on furnace thickness too. Hot gases coming out of furnace enter the second pass through reversible chamber. Most of the standard fire tube package boilers are of three pass type furnace being the first pass and two additional passes to cool the gases to a reasonably lower temperature. Four pass boilers which offer a little higher efficiency for a bit higher price are also available. Some boilers are provided with helical coils inside the tubes to enhance the heat transfer and thus increase the thermal efficiency of the boiler. Boiler parts include One or two furnaces, turaround channel or reversible chamber, 2,3 or 4 gas passes of tubes, two tube sheets on both ends, internal gussets and stay rods, moisture separators, gas boxes at both ends, saddle suports , skid mounted and fitted with oil,gas burner or internal, external grate for firing soild fuels like coal,bagasse, rice husk,lignite ..etc.